Describe the ways in which wood can increase sustainability and design attributes of specialty applications and tall buildings. Define specific types of heavy timber and other wood materials that can be used to support the design and structural integrity of commercial and industrial buildings. 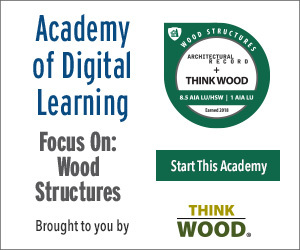 Explain the environmental-impact benefits of wood structures and the ways in which green building codes can be met, including the stringent requirements of the Living Building Challenge. Discuss the unique fire-protection features of heavy timber in large-scale building projects. Michael Green Architects' Wood Innovation Centre in Prince George, British Columbia, Canada, breaks ground in May. On October 31, the Wood Innovation and Design Centre (WIDC)—a 96-foot-tall, 51,000-square-foot structure built almost entirely out of engineered wood components—opened in Prince George, British Columbia.